When I was doing research for my article on the 33rd Annual Rimini Meeting I noted that the entertainment portion of the meeting’s Opening Encounter included a premiere showing of the Disney Pixar animated film Brave. It was shown to the audience in multiple languages, then discussed and praised. One cannot help but wonder what an animated cartoon movie is doing on the agenda of the largest religious gathering in Italy attended by adults who want to fortify their faith. Various reviews have applauded this movie for empowering mother-daughter relationships, heralding it as a well-crafted feminist film of near perfection. In it, a youthful protagonist princess confronts her mother head on at a time when the men of the world are presented as rowdy drunks and women in full control — all set in a lush, beautiful Scottish-Celtic countryside. 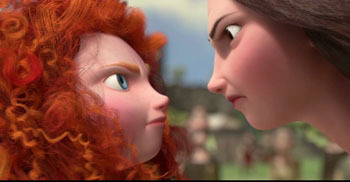 This is the main plot: Princess Merida, the firstborn daughter of King Fergus and Queen Elinor, rejects her mother’s attempts to make her a proper lady and queen and spends all of her free time practicing archery. She defies her parents by refusing to accept any of the three idiot suitors chosen for her. To change her mother’s attitude, she asks a witch for a spell, but the spell turns the Queen into a bear. Finally, after Merida takes responsibility for her action and apologizes, her mother returns to her proper form and everyone is happy, especially Merida because now her mother agrees that she is free to shape her own destiny and does not need to follow old-fashioned protocol. It is obvious that the overt purpose of Brave is to encourage our youth to rebel and reinforce the importance of the feminist movement in achieving its goals. While this movie certainly delivered the progressivist feminist message, to my surprise, the movie fell far short, with the exception of its CG graphics and music, in doing so in a manner reflective of the usual high quality standards of Disney Pixar. In my opinion one reason for this was it packed too many subplots and messages, or so-called lessons, in a 90-minute film. In fact, certain parts of the film were over-the-top obnoxious, chaotic and difficult to watch. One of the most annoying aspects of the movie was the exaggerated physical distortion of King Fergus and every male character in the film. All were presented as absolute idiots intellectually speaking, which perhaps explains their continuous drunken and rowdy behavior. If that were not enough, the obnoxious, uncorrected behavior of the three young redhead brothers of Princess Merida was extremely hard to take. Of course, the loutish stupid males contrasted completely with the extremely attractive, well mannered and dignified Queen Elinor, who maintained the noble qualities and eloquence necessary to keep a kingdom composed of four Scottish clans in line — a role historically played by the King with the support of his Queen. More offensive to the intelligence is that we are expected to believe that a woman of the stature of Queen Elinor agreed to marry the vulgar boor King Fergus, who in his youth was undoubtedly a replica of the three buffoons from whom Princess Merida must choose a husband. It would be impossible for any family, let alone a society, to exist harmonically with such extreme disparities between women and men. 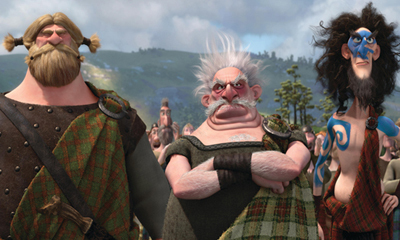 Another irritating thing in Brave is to see the triplet boys running amuck, playing constant pranks. We do not expect the loutish King to reprimand them, but they are also never corrected by the Queen, sending the message that a mother’s responsibility is limited to daughters. This suggests that the Princes should grow up with the same values as the rest of the men in the kingdom — as self-centered useless oafs. How any Catholic could watch this movie and not be offended is beyond comprehension. I believe that these feminist messages alone would be enough to make parents ban this film from their homes, but if more evidence is required, one need only look to the witchcraft, legends and spells interwoven in the film. Like Harry Potter and so many other stories directed toward children today, this acclimates them to paganism. As mentioned before, Princess Merida asks a witch to cast a spell upon her mother, which turns her into a bear. Even though the Princess was not expecting this disaster, she shows no compassion for what she has done. In fact, shortly afterward we see her laughing as she frolics in the stream watching her mother trying to catch fish, chuckling to see her lose her ladylike ways. Of course, we have all seen the use of spells in Disney movies going back decades. But I did not expect the poisonous apple given to Snow White to put her into a deep sleep until a valiant and handsome Prince awoke her from her slumber with a soft kiss to lead to where Brave brings society now. One might pose the question as to how the innocuous fairy tales of long ago evolved into the type of propaganda that we are experiencing today in motion pictures and television. Throughout the film one can find nuanced and easily-missed scenes that denigrate traditional religion and society. One worth noting was the scene where the witch shows the Princess her many bear-themed items for sale. One was a parody of Michelangelo’s creation of Adam, featuring bears in the place of God and Adam. I have since learned that this religious artwork has similarly been defiled by The Simpsons, The Muppets and Star Wars. As for this movie’s lessons on fate, the message is one that calls for youth — especially girls — to defy conventions and authority and direct their own destiny. 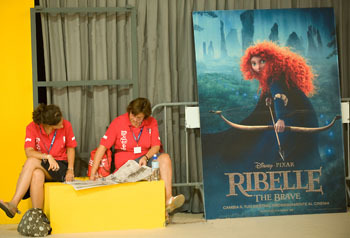 One can only imagine how this would translate into the discussions after Brave’s showing at the Rimini Conference. A woman should not be denied her ‘destiny’ to be a deacon, an administrator, a theologian, a priest…The man-centered Church of the past needs the correcting influence of women in places of authority. As for the lesson of pride, this also falls flat. For even after Princess Merida supposedly overcomes her pride and realizes the magnitude of what she has done to her mother and the disastrous consequences, the movie still ends on a dangerous note. In the end the mother — and thus the husband she controls — capitulates to her daughter’s original desire, to not marry as they wish but as she wishes and to continue running wild on her horse practicing archery. There is really no correction of pride here, since Merida’s will prevailed and she can now consider herself her mother’s equal. After all, is this not the progressivist goal — empowering our youth to rebel against all authority, including their parents?